Everything Seasoning is EVERYWHERE. It’s one of the hottest flavor trends right now. 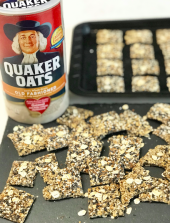 I’ve partnered with Quaker to create the perfect everything seasoning recipe… Quaker Everything Oat Crackers. I use oats as the base of this cracker because they are 100% whole grain. I use oats in so many of my recipes because ½ cup serving of whole grain oats is considered a good source of fiber, which can help support a healthy digestive system, as well as provide important vitamins & minerals. I especially love these crackers in the summer on a veggie & cheese board. They are also great with a little tuna salad & veggies for a lunch. Crunchy, flavorful, and a good source of fiber – 6 crackers give you 4 grams of fiber! Make a batch today! In medium size bowl mix together flaxseed and water until well combined. Set aside for 10 minutes until mixture thickens. In a food processor pulse 1 ¾ cups Quaker Old Fashioned Oats until flour-like consistency (~10-12 pulses). In a small bowl mix together sesame seeds, black sesame seeds, poppy seeds, dried minced garlic, dried minced onion, and sea salt. Set aside. To the flaxseed mixture, add oat flour and half of the seed mixture. Mix with spatula until dough texture. Use hands to form into a ball. Place dough ball onto a large sheet of parchment paper and use hands to press out into a 15” x 10” square (or use rolling pin). Place parchment with cracker dough onto a large baking sheet. Sprinkle remaining seed mixture and ¼ cup of oats evenly over the top of the cracker dough and lightly press into the dough. Place baking sheet into 350˚ oven and bake for 20 minutes. After 20 minutes remove from oven and cut cracker dough into 54 pieces using a pizza cutter (8 even cuts along the 15” side & 5 even cuts along the 10” side). Slightly separate the pieces, leaving a little bit of space between each cracker. Return to oven and bake at 350˚ for another 20 minutes. Remove from oven, let cool for 15-20 minutes. ENJOY with your favorite dips, hummus, cheese, veggies and more! These crackers sound delicious! I can’t eat garlic and onions (as I’m trying to stick to the FODMAPs diet). Could I make these without those 2 ingredients? Or, would I need to substitute another ingredient for them? Hi Dawn! Can’t wait to try these crackers! 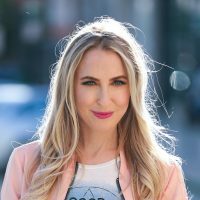 What other recipes do you use oats in? Do you have any bread recipes? I would love to see more recipes with oats!